The New Pornographers In Concert With stunning vocals from Neko Case and playfully cerebral narratives from songwriters Dan Bejar and A.C. Newman, the Canadian band is virtually peerless in the world of power-pop and indie-rock. The band gives a full concert, recorded live from Washington, D.C.'s 9:30 Club. Benjy Ferree, Emma Pollock Open Show from Washington, D.C.
With stunning vocals from Neko Case and playfully cerebral narratives from songwriters Dan Bejar and A.C. Newman, the Canadian band New Pornographers is virtually peerless in the world of power-pop and indie-rock. The New Pornographers gave a full concert on NPR.org Oct. 27, webcast live from Washington, D.C.'s 9:30 Club. Hear the performance online, with opening sets by Benjy Ferree and Emma Pollock. The band is on tour in support of Challengers, its fourth full-length release. The disc is a melodic, hook-drenched collection of songs Newman says were inspired by his recent move to New York, finding love and the universal search for meaning. Though as passionate as the band's earlier work, Challengers feels slightly more wistful and melancholic. On the album's title track, Newman sings about finding new love out of nowhere and trying to play it cool. "When I wrote the lyrics I thought of the Camus quote from the liner notes to a Scott Walker album," he says. "'A man's work is nothing, but this slow trek to discover through the detours of art, those two or three great and simple images in whose presence his heart first opened.'" The New Pornographers is a collective of sorts, with members from several other popular Canadian bands. Newman is from the group Zumpano, while bassist John Collins is from Thee Evaporators and guitarist Dan Bejar moonlights in Destroyer. Keyboardist Blaine Thurier is a well-known cartoonist and filmmaker. Singer Neko Case has an established career as a solo artist. 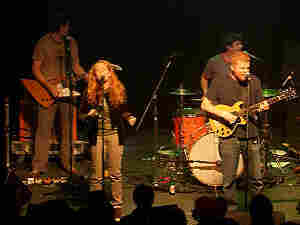 The New Pornographers also features Kurt Dahle on percussion, Todd Fancey on guitar and Kathryn Calder on vocals and piano. Benjy Ferree is an artful singer-songwriter based in Washington, D.C. His 2006 album, Leaving the Nest, is loosely based in American roots music. Emma Pollock is a former member of the Scottish pop group The Delgados who just released her solo debut, Watch the Fireworks.